And what do you do about things like question marks? Use phonemic transcription plus punctuation? What is acceptable? For three-quarters of a century the journal of the International Phonetic Association, then called Le Maître Phonétique (lə mɛːtrə fɔnetik), was written entirely in transcription. 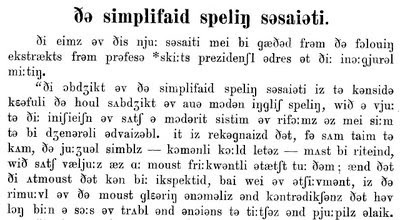 Here is an extract from one hundred years ago, from the issue dated vɛ̃tkatriɛm ane 5-6 mɛ - ʒɥœ̃ [sic] 1909. You will see here that the custom was to ignore stress and to use ordinary punctuation, including quotation marks. The asterisk denotes a proper name. This is only what one would expect, given that the early ambition of the IPA was to supplant traditional orthography, at least for language teaching. And here is an extract from a more recent article, the youthful David Crystal’s ə pəspɛktɪv fə parəlaŋɡwɪdʒ (m.f. 1963, 120: 25-29). Here, too, stress is ignored and ordinary punctuation is used. Additionally we find cited terms in italicized orthography. Funny - when I first tried taking French around 1990 we were taught there were four nasals, but but the time I last tried (2005) /œ̃/ had disappeared (sorry, looks like I can't copy the tilde properly). Of course, my last teacher was a native speaker, so she should indeed have been up to speed. I too am surprised at ʒɥœ̃ for "juin": was it simply a typo? And I would have expected vɛ̃tkatriɛm for "24ème". Sorry, Nigel, the missing t was my typing error (too worried about getting then tilde right!). But I am really surprised to see ʒɥœ̃ not ʒɥɛ̃. Perhaps the most striking discussion about using punctuation marks in transcription was the 1959 paper by John Trim 'Major and Minor Tone Groups in English', mf vol 112, pp.26-9, which argues for not using punctuation, and also for leaving out inter-word spacing unless rhythmically justified. Written in phonemic transcription without punctuation and with many word spacings suppressed, it's a hard read (but a good student exercise). ʒɥœ̃ for juin does not surprise me all that much. Words like these, where the nasal vowel is adjacent to other labialized sounds, must have been among the last holdouts of phonetic, if not phonemic œ̃ in standard (Parisian) French. Luke: Do you mean that you would expect "juin" to be pronounced as if written "jueun", thus sounding like a modified version of "a jeun" (on an empty stomach)? Well, I'm still surprised! Sounds like hypercorrection to me. Sorry, accents hard to produce on this computer. Well, I'd have to listen in more closely in order to have a definite answer to that, but yes. œ̃, at least for some speakers, is an allophone of ɛ̃. Especially in rapid, informal speech, I would expect juin to be pronounced ʒɥœ̃ (or ʒwɛ̃) even today. ɥ is just too rounded. I haven't got (or can't lay my hands on) the issues of the m.f. between 1914 and 1924. However, I can say that up to 1914 "juin" was regularly written ʒɥœ̃. From 1924 onwards it was written ʒɥɛ̃. Also, luke, people have often quoted "juin - joint" as a minimal pair for ɥ vs. w. Were they wrong? ʒwɛ̃ for juin is common, but not fully accepted yet (cf. this little gem). "juin - joint" is a minimal pair only for those speakers who still pronounce juin ʒɥɛ̃ ~ ʒɥœ̃. "lui - Louis" is more reliable. Technical note: I have a problem with the font used for comments in this blog. It doesn't handle nonspacing characters properly, at least not on Debian GNU/Linux, which I use. I see all tildes in the above comments on the wrong letters and I understand that Sili has the same problem. Only comments are affected, because the font used for IPA in the main posts, Lucida Sans Unicode, works well. If the blog stylesheet cannot be changed, a possible workaround is to disable stylesheets in the affected pages: you lose most formatting, but the informational content is intact and rendered very clearly in a default font of your choice (DejaVu serif for me).The spellings jeun (“fasting”) and juin date back from the 12th century, and as far as I understand there is some disagreement about their ancient pronounciation. That pair exists in Piedmontese, where it sounds [dʒyŋ] ~ [dʒyɲ] and theoretically in Occitan jun ~ junh, /dʒyn/ ~ /dʒyɲ/, where actual modern realizations include [dʒy] ~ [dʒyn], or even no opposition, [dʒyn] for both. So it might be that the loss of rounding in juin is very recent, and those Québécois who still pronounce /ʒɥœ̃/ might have history on their side. However, Petit Robert (1993), which uses a normative 16-vowel IPA transcription and still distinguishes between /ɛ̃/ and /œ̃/, recommends /ʒɥɛ̃/. This might be a spelling pronounciation. ... not in Belgium, it ain't! Belgae a cultu atque humanitate longissime absunt: No civilized country would let ɥ go the way of the dodo.